How Did Inflation Happen — and Why Do We Care? 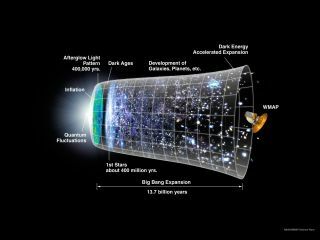 In 1980, physicist Alan Guth proposed a radical extension to the standard Big Bang model of the history of the universe. At the time, it was known that our cosmos is expanding — it's getting bigger and bigger single day — but the expansion rate is relatively mild. Guth hypothesized that in some of the very earliest moments of our universe (somewhere around the 10^-36 second mark), our universe underwent a period of exorbitant accelerated expansion. During this period, the universe inflated by a factor of 10^26 in a mere 10^-32 seconds — a lifetime compared to the then-age of the universe, but the tiniest sliver of a moment to our more mature eyes. In the decades since Guth's initial, tentative proposal, the concept of inflation has remained frustratingly mysterious, but it still stands as our leading theory of what went down when our universe was young and exotic. In our modern conception of cosmic inflation, that period of rapid, accelerated expansion is driven by a new character to join the cosmological cast: something called the inflaton. Get it? The inflaton inflates. Not the most creative name, but there you go. In this picture, the inflaton is a quantum field that permeates all of space and time. It's the same as any of the other quantum fields out there — the electromagnetic field responsible for photons, the Dirac field responsible for electrons and so on. Quantum fields are our theory explaining the underlying structure for all of matter and radiation, and they are kind of a big deal. So, it's not entirely ridiculous to propose a new kind of quantum field that majorly affected the early universe but isn’t very noticeable today..
Another feature of quantum fields is that there's a certain amount of energy associated with them, even in the vacuum. If you take a box and evacuate all the particles and radiation from that box, resulting in an absolutely pure vacuum, the box will still contain some energy. This energy can be seen as a fundamental vibration in the quantum fields that make up reality. That part is important, because that vacuum energy has the curious property of accelerating the expansion of the universe. We don't know ahead of time what the vacuum energy of any of the individual quantum fields might be. If it's zero, then we would see no accelerated expansion at cosmic scales. If it's a large value, then the universe might just inflate. In the inflation model, the inflaton is a quantum field that starts off with a large amount of vacuum energy. The universe goes whoosh, and inflation does its thing. But then, the inflaton (somehow) changes and reduces its vacuum energy, shutting off the inflationary epoch. I'm being kind of vague here, because the physics are, well, kind of vague. At the close of inflation, the inflaton has one last trick up its sleeve. Before it fades into oblivion, it decays, transforming itself into a flood of regular matter and radiation. Again, this isn't as crazy as it seems, because quantum fields are perfectly capable of transforming into one another on a whim (this is the modern picture of complex particle interactions). This last-minute event, known as reheating, seeded the large, cold and empty universe with fundamental bits and pieces. These would eventually grow up to be protons, atoms, gas clouds, stars and galaxies. That's a nice story, but how do we know it's right? For inflation, the devil is in the cosmological details. The inflation model predicts that the freshly deposited matter and radiation wasn't just scattered around without care. No, there was a pattern to it. The mechanism of inflation didn't just rapidly expand the universe; it also rapidly expanded everything in the universe, including the fundamental vibrations built in to the inflaton quantum field itself. These vibrations were expanded one after another, leading to a universe full of tiny bumps and wiggles — minute variations in density from place to place. And inflation teaches us that those bumps and wiggles had a particular pattern. Specifically, there should be just as many small bumps and wiggles as large bumps and wiggles. Additionally, as those bumps and wiggles evolve in the newly inflated universe, they shouldn't really be connected to each other. In the jargon of cosmology, these bumps and wiggles should be nearly scale-invariant (like an orchestra in which the low-pitched and high-pitched instruments have exactly the same loudness) and Gaussian (each member of the orchestra is playing from a different set of music, and there's nothing coordinating them). These tiny differences in density grew as the universe evolved, with slightly higher-density pockets accumulating more and more matter. This, in turn, gave them a stronger gravitational influence on their surroundings, which caused them to grow ever larger, and so on. Small differences in density became large differences in density, imprinting themselves in the temperature pattern found in the cosmic microwave background, the leftover light from when the universe was only 270,000 years old. From there, the differences continued to grow, accumulating matter to be become the seeds of all structure in the universe, from single stars to the cosmic web itself. And detailed studies of those patterns reveal them to indeed be nearly scale-invariant and Gaussian, exactly what inflation predicts them to be. Even though the physics of the process aren't well understood at all and are admittedly pretty sketchy, inflation has succeeded in passing every experimental test thrown at it. Perhaps someday, a better understanding of this extraordinary epoch in our universe's history will paint a completely different picture, but in the meantime, the story of inflation — as thin as it might be — is our best bet. Learn more by listening to the episode "Why Do We Need Cosmic Inflation? (Part 2)" on the "Ask a Spaceman" podcast, available on iTunes and on the Web at http://www.askaspaceman.com. Thanks to Massimiliano S., Lorenzo B., @ZachCoty, Pete E., Christian W., @up_raw, Vicki K., Thomas, Banda C., Steve S., Evan W., Andrew P., @MarkRiepe, @Luft08, @kazoukis, Gordon M., Jim W., Cosmic Wakes, Floren H., Gabi P., Amanda Z. and @scaredjackel for the questions that led to this piece! Ask your own question on Twitter using #AskASpaceman or by following Paul @PaulMattSutter and facebook.com/PaulMattSutter. Follow us on Twitter @Spacedotcom and on Facebook. Original article on Space.com.